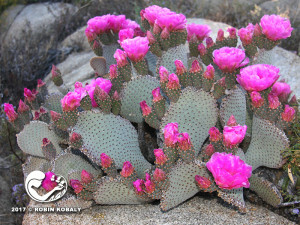 Beavertail is a maintenance-free cactus native to California and the west that adds spectacular color to southwest gardens with its hot-pink flowers in spring. Beavertail Cactus has flattened pads that truly resemble their namesake. 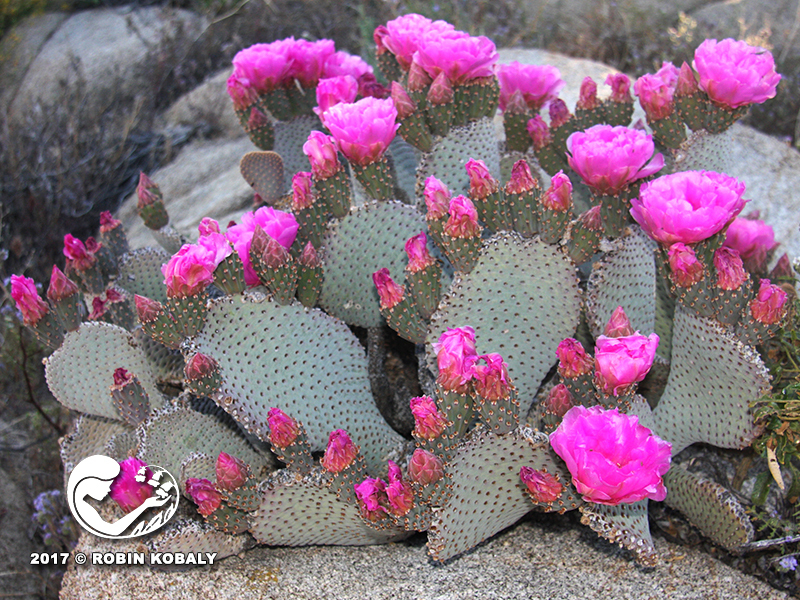 This slow-growing California native from both the Mojave and Sonoran Deserts is dotted with clusters of tiny spines called glochids, which are set into dimples across the pads (making the pads look like a beaver’s tail). A single plant may have hundreds of blue-gray, succulent, flattened pads, which can become wrinkled in summer, but plump after rains. Hot-pink flowers in spring are stunning–and are irresistible to beetles and other pollinators. Individual pads may be transplanted to extend plantings. 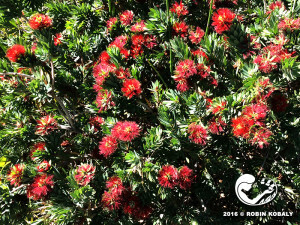 While being extremely low-maintenance and easy to grow, it dislikes clay soils, acid soils, shade, and too much watering. Water rarely if at all. Always wear gloves when working with or around this beauty, and keep it away from pathways. Desert rodents and birds eat the tiny black seeds. 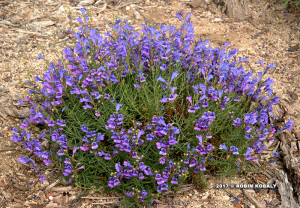 This low-growing groundcover compliments and accents rock and succulent gardens, wildlife gardens, and dry washes. 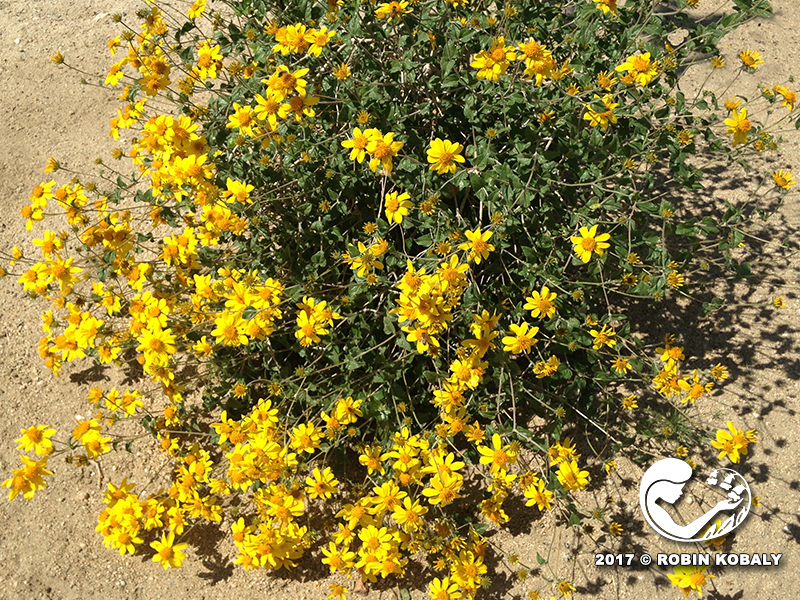 This California native plant offers a long season of bright, daisy-like, yellow flowers, while tolerating heat, drought, poor soils, and even reflected heat. At the same time, it resists rabbits, but attracts butterflies, songbirds, and beneficial pollinators. Goldeneye is blanketed with bright, golden flowers on long stalks, contrasting nicely with its dark-green leaves — which feel like a cat’s tongue due to their stiff hairs. A moderately fast-growing, winter-deciduous shrub that attracts butterflies, songbirds, and beneficial pollinators, but resists rabbits. This perennial sunflower will crown sprout back from its roots after winter dormancy, so don’t fret if it freezes to the ground – it is root hardy. Goldeneye will repeat bloom with some summer water. Trim back after bloom cycle for more flowers and denser, neater growth. 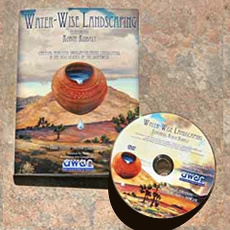 Performs well in both high-desert and low-desert gardens, naturally growing from sea level to 5000 feet in elevation. Goldeneye is extremely heat tolerant, and doesn’t mind reflected heat or poor soils. Nice mass of color to border a fence, for a background in the garden, in dry washes and rock gardens, or to fill in a naturalized area. 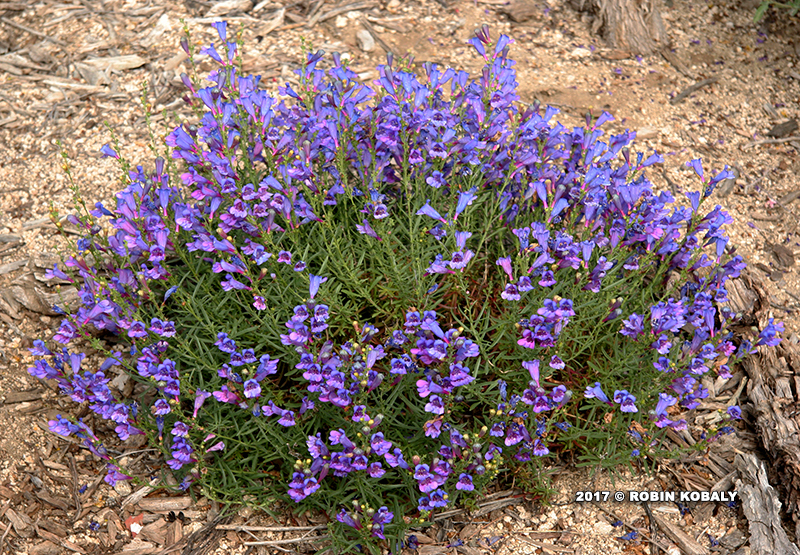 Besides being drought-resistant, fire-resistant, and resisting browsing by rabbits, this tidy, evergreen, California native is versatile as either a hedge, screen, border, ground cover, or bank stabilizer — and works in large containers. Coffeeberry is touted as looking “trimmed without trimming”, although this tidy evergreen does take pruning well. This long-lived California native, also known as California Buckthorn, grows naturally in a wide range of habitats, with many available varieties, so check with your local nursery to find the one that best fits your climate. 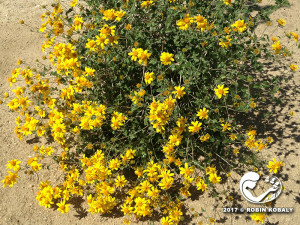 While commonly growing in chaparral and woodland habitats just above our deserts, it performs well in high deserts if given filtered or afternoon shade, and water once a week for its first year. Coffeeberry’s fruits contain seeds that resemble coffee beans. 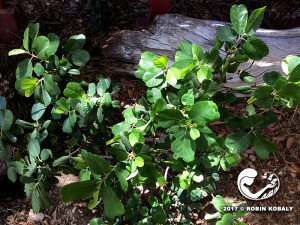 Its light-green, 2 to 4-inch-long leaves mature to a leathery dark green. Inconspicuous greenish-yellow flowers in spring produce showy berries that are green, then red, and finally ripen to black, when they are relished by birds. Coffeeberry is fire resistant, resists browsing by rabbits and deer, and makes a great hedge, screen, border, ground cover, or bank stabilizer, and performs well in large containers. 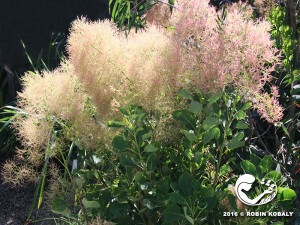 Masses of pinkish, billowy hairs on spent flower clusters are what create the illusion of smoke from summer to fall on this intriguing shrub or small tree. Smoke bush has the added surprise of fall leaf colors from yellow, orange, and red to purplish-red foliage. 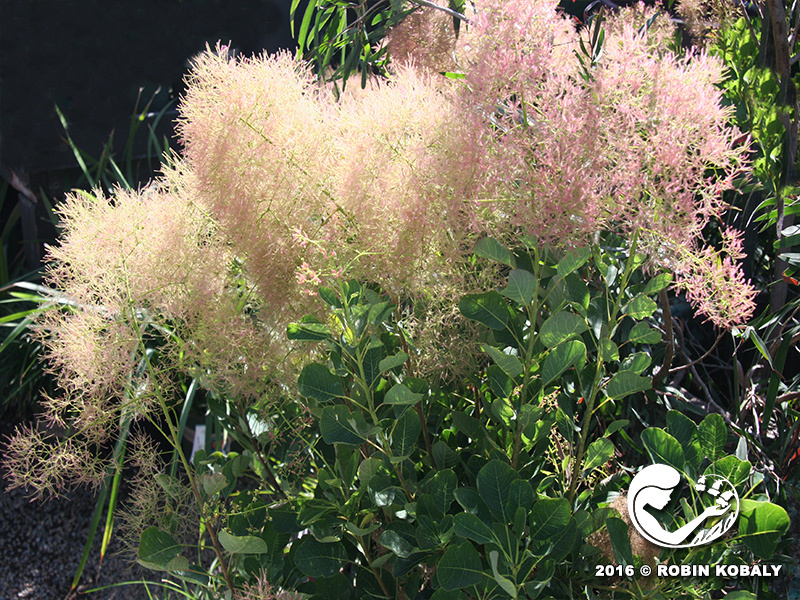 Smoke Bush ‘Young Lady’ will treat you with billows of “smokey” flower clusters from summer through fall. Smoke Bush gets its common name not from the tiny, yellowish flowers in spring, but from billowy hairs on the stalks of spent flower clusters, covering the plant with fluffy, hazy, smoke-like puffs from summer into fall. This new variety is noted for blooming early as a young shrub, with feathery blooms covering the plant’s blue-green foliage. Other varieties, such as Royal Purple Smoke Tree (12 – 15 feet tall), produce pinkish-purple, smoke-like airy seed clusters backed by reddish-purple foliage. Fall leaf colors vary from yellow, orange, and red to purplish-red. For the best bloom, prune very lightly in early spring. Hard pruning to the framework induces new growth with larger leaves, but compromises flowers. Useful as a single specimen, grouped or massed in shrub borders, or as an informal hedge or screen (a smoke screen! ).